Handling abused horses (depending on the level of abuse) is something that often is best left to those with experience. Some abused horses can be very dangerous to be around. Not only to people, but to themselves as well. Abuse comes in all varieties, from physical to mental. A lot of abuse isn’t even intentional on the owner’s part, but often-just ignorance. I like to think highly of my fellow man and I am in hopes that very few people set out to be cruel to the horse. Lets take a look at some of the aspects of physical and mental abuse to horses. Constant overexposure – anything that’s done to a horse that he can’t adjust to, can’t handle or doesn’t fit into his way of understanding. (Example—tying up a horse that hasn’t been taught to stand still or letting him step on the reins.) Signs of mild overexposure in a horse might be grinding the teeth, holding his breath, panting, or prancing in place. Extreme overexposure is a disaster – something we hope to avoid. Bill Dorrance, in his must read book True Horsemanship Through Feel explains this. Isolating the horse. I think in some ways this is a form of mental abuse from other horses. Especially if the horse is then ignored or neglected by the human. Pushing the horse (particularly young ones) for to much – to soon. A lot of colts are started to early and pushed way to hard. This shouldn’t be. We don’t send our kids to kindergarten and expect them to read profoundly after the first month. The following examples are from a couple of abused horses that I have dealt with. Billy’s owners called me about taking him to start in the saddle, so we scheduled a day for them to bring him. When they arrived, I immediately saw signs of abuse. Billy hadn’t been haltered. They said that he was hard to catch. They kept warning me to be careful and were vague about this three year old paints past. It didn’t take but one time in the round pen to figure out that Billy had been severely abused. I called the owners that night and had a little talk, advising them that this was going to take some time. I asked them if they wanted to proceed, and they did. So we gave it a go. I did some rope work with him to get his hindquarters, with the hope of haltering him. At this, Billy would shake violently and try to clear the fence or come at me, ready to fight. A month later, I was finally able to walk up slowly and pet him, even brush him some. Upon brushing him, I found spur scars up his neck and down his shoulders. Again I called the owners and told them to come out so we could visit. When they finally did, I made known them that someone had terribly abused this horse. Their reply was that someone used him for a bucking horse for a while in a backyard rodeo. I advised that this would be a very long process if at all, but they wanted to continue. Long story short… I called some trainers whose friendship and experience I valued, and there advise was that he probably should be put down. After another month of working with Billy, I could pet and brush him without difficulty, but that was about it. Even after 2 ½ months, if anyone else other than myself tried to handle him, he would relapse back to his previous behavior. In discussion with the owners, I conveyed to them that as a result of the abuse that he had suffered, Billy was a danger to himself. After much soul searching and thought and after consulting with other trainers, I recommended that Billy should go to a sanctuary or be put down. They agreed to pick him up, but they didn’t want to get rid of him. I referred them to some places that took abused horses and just let them live out there days. However, they said that they knew someone that could get him broke. I gave Billy a dose of ?tce” to help him through the loading and hauling. The owner’s last words were “with that medicine, he’s so calm, I bet we can saddle him and ride him when we get home.” I think of this abused horse every so often and wish I could have helped him or at least helped his dishonest, ungrateful owners. Maybe at this stage in my life, I could have gotten through to him, but maybe not. The lesson here is to handle abused horses very carefully. Some of them (though no fault of there own, just exercising there God-given right to self-preservation) can be dangerous to you and themselves. 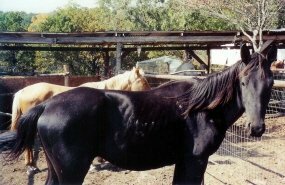 Sam was a 16.2 hand, bay, thoroughbred gelding, who had gone from the track to a jumping barn without any real retraining. He was owned by a little girl who just loved him, but he was out of control. They called me to ask if I would take him because he had thrown the girl, breaking her ankle. He had also thrown their jumping instructor, injuring her arm and shoulder. We made arrangements and they brought him out. His little owner (on crutches) wanted my word that I wouldn’t hurt him and that I would “be nice to her Sam.” After reassuring her and encouraging them to call or come out anytime, they left Sam in my care. Now, some would think that Sam wasn’t abused or that perhaps, Sam was the abuser. We have to remember though, that with a horse, it’s never personal. Sam was just doing what he thought was right – to survive. The first thing I had to do was to ask for Sam to respect me. He had been handled with a halter/chain combo, and rightfully resented it. When Sam wanted to walk off or take over, he did. He was all over a person on the ground – pushing, stepping on you etc. With a whole lot of feel, Sam learned to lead up free and respect the human. The first thing we did with respect to riding was to help him yield at the poll and disengage his hindquarters. This meant a lot to him and he responded well. With a lot of easy and slow riding, Sam soon became very responsive and a pleasure to ride. With his size, he could cover a lot of ground and he had an awesome trot. When the owners returned to pick him up, the little girl and her dad and mom cried. I think they were amazed. This isn’t to toot my horn at all. I’m constantly humbled and amazed at the things our horses will do for us when we use feel and understanding. Some would say that the Sam wasn't an abused horse, or that the previous way Sam had been handled wasn’t abuse. I disagree! Sam had been taught to brace against the bit and just run around the track. On the ground, he had been taught that at any minute, for reasons he couldn’t understand, a chain would be jerked around his nose causing him unexpected pain. When offered a good feel, his true self came out. No matter what type of abused horse your dealing with, there are several guiding principles to follow. 1. Go slow! When you think you’re going slowly – try to go slower! This works on the abused horse or any horse. Tom Dorrance in True Unity said that slower is faster with horses and he is right. 2. Spend quality time with the horse. Abused horses cannot be given to much petting, rubbing and love. 3. Reward the slightest try. A person should always be looking to do this. 4. Operate with a lot of feel, because this is all the horse can go on. These are both good sources of training on handling abused horses as well as any horse you work with. If you have any questions or comments on handling abused horses, please contact us.